Tipard Windows Password Reset portable is the professional tool for recovering the password of Windows computer. Whether you lost or forget the password incautiously, you can easily reset the password on all Windows computer including Windows 7/8/10. In addition, this software provides two simple solutions for you to reset your Windows password within clicks. Lost your Admin password for Windows PC and have no other admin account to login? Forgot your Windows 7 user password instantly you just changed? Set a new Microsoft account but lost the password immediately? Or lend your PC to others but the password was changed accidentally. Even you bought an old Dell laptop installed Windows 7 but don’t know the admin password. And forgot Windows 8.1 login password but there is no reset disk. More circumstance you may meet, the Windows Password Reset is the easiest tool to solve these problems above. It can reset administrator/user password or other guest password with simple steps no matter how complicated the pass code is. Besides resetting Windows system password, it is also access to create a new administrator account without logon. And then you can regain the locked system by this new account. If you have already downloaded and installed the Windows Password Reset software on your accessible computer, and then just need two simple steps to finish resetting password. There are two options provided for you. Create bootable CD/DVD – Burn the password reset software to a CD or DVD and then recover Windows password with the bootable CD/DVD. If you prefer using USB flash drive or have no reset disk to use, then you can select creating a password recovery USB drive. It can also boot your computer and reset Windows pass code easily. Both of the operations are convenient to use, you can choose the one according to your needs. And then insert the burned CD/DVD or USB drive into the locked computer to reboot it. The last step is to recover your needed password to unlock the Windows. 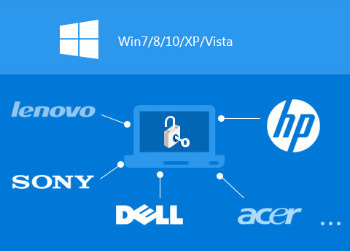 This Windows Password Recovery is compatible with almost Windows operating systems. Use it easily based on Windows 10, 8.1, 8, Windows 7, Vista, XP, NT, etc. Also support Windows Sever 2012, 2011, 2008, 2003, etc. Besides supporting almost Windows operating system, it also supports all Windows Workstations, a variety file systems like FAT16, FAT32, NTFS, NTFS5, many types of hard disks including IDE, SCSI, SATA, 1394, USB, SAS, RAID and RAID/SATA/IDE/ SCSI/SAS drives, etc. With the easiest Windows password reset tool, you can recover password on many brands of computer no matter it is laptops or desktops. Such as Dell, HP, Acer, Sony, Lenovo (including ThinkPad), ASUS, Gateway, Toskhiba, IBM, etc.